The only Droid Gunship mod you'll ever need! Photino1's Ultimate Trade Federation Gunship Overhaul replaces that boring old CIS gunship with a shiny new - or rather, weathered and old, Trade Federation gunship. The only Droid Gunship mod you'll ever need! 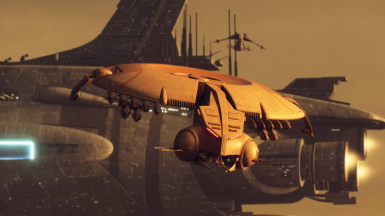 Photino1's Ultimate Trade Federation Gunship Overhaul replaces that boring old CIS gunship with a shiny new - or rather, weathered and old, Trade Federation gunship. Featuring 4k textures*, custom handmade normals*, materials edited to perfection*, custom diffuse maps made with painstaking detail*, and a 100% screen accurate appearance*, this mod gives you the perfect Droid Gunship experience.